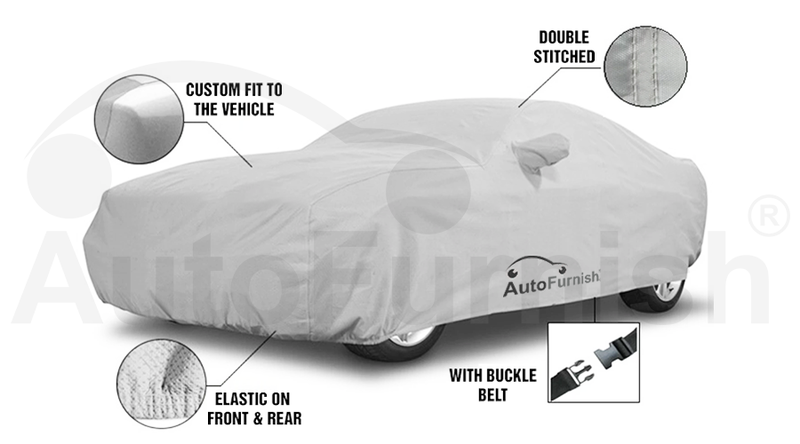 Autofurnish Premium Silver Car Body Cover is custom fit solid silver color gives a whole new looks to your car. Cover includes side mirror pockets which are made precisely to the size of the mirror. This car cover is made of Silver matty protects your vehicle against wet, humid and dusty climatic conditions. Double Stitched High Quality imported threads used to stitch the cover tight and securely protects your vehicle against natural pollutants, animal droppings, tree sap, industrial pollutants, and airborne dust and dirt. A tailor fit storage bag is included. Storage bag keeps your cover clean, tidy and tucked away when not in use.